HJLCMS and Hugh Lofting Timber Framing (HLTF) designed and built the home to work with the Earth. “The house is sited to maximize passive solar gain in the winter but is designed to be shaded from too much sun in the summer,” says Hugh Lofting, company president. Concrete floors and a real fireplace, made from Avondale Quarry stone, were used to create a thermal mass to maximize passive solar heat gain. Coupled with tight construction and a seamless blanket of insulation is a solar thermal heating system installed by Radiant Comfort Systems that utilizes the heat energy of the sun to warm the in-floor radiant system. For those few really cold days, peak-heating demand can be met with two wood burning stoves and a geothermal heat pump. This is where the wood stove now sits. All three floors of the home contain radiant heat. 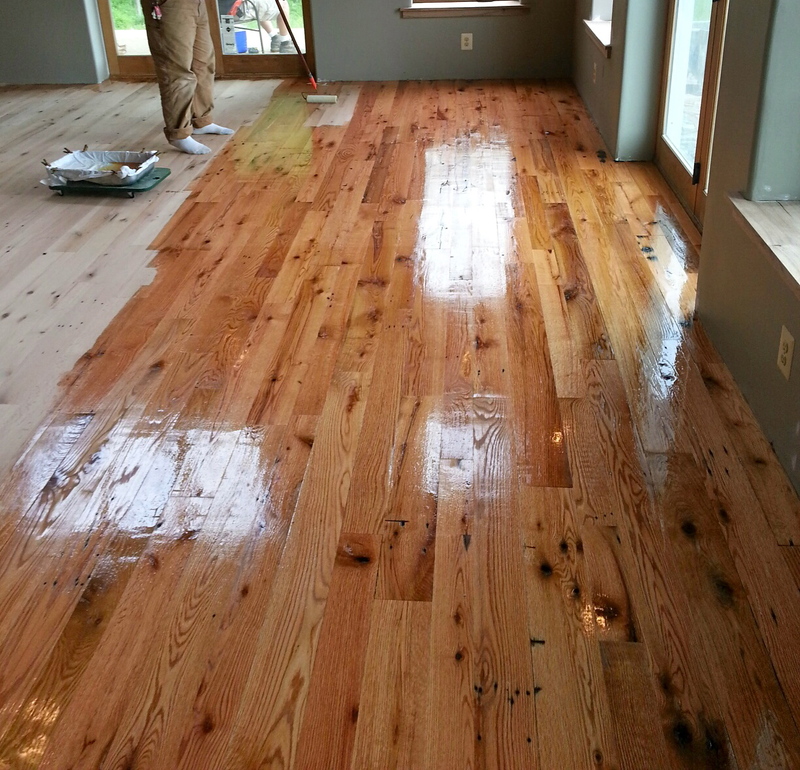 The basement and the first floor are hand troweled concrete which is stained then polished. Both locally sourced labor and material were used to help bolster LEED rating points. Additionally the recycled content of the concrete was traced and documented to gain additional points. Local, yet nationally recognized, company Hyde Concrete was contracted to transform the concrete from a gray slab of material to a finished product with deep tones of color to create a warm atmosphere. From the warm leather tones in the finished basement entertainment area to the accents in the terra-cotta first floor the polished concrete brings a modern touch to the home. Stained and polished concrete floor. The same solar thermal system provides domestic hot water to the home. The domestic water system is backed up with a propane fired instant hot water system for peak demand. The hot, humid summers of coastal Maryland posed a comfort challenge. The home is positioned to take advantage of prevailing winds for natural ventilation and is equipped with large, high-efficiency, operable windows throughout. The mechanical system includes passive nighttime cooling through the solar thermal panels with a geothermal heat pump as back up. Regardless of the mode of operation, a healthy indoor air is maintained via Energy Recovery Ventilator (ERV) that efficiently maintains temperature while introducing fresh air. In addition to using ERV, the home utilizes the radiant system to cool the home. Radiant cooling along with minimal ducting help control the humidity and allow the home to be comfortable in the summer. HJLCMS utilized a systems approach to construction that reduced site generated waste and construction time while increasing quality control. The precast concrete foundation wall system from Ideal Walls provides an R-23.5 at the basement walls. The timber frame crafted in the HLTF shop is enveloped by Murus Company Structural Insulated Panels (SIPS) that provides R-40 insulation on the walls and roof. Although there are a number of windows on the south wall for solar gain, windows on the other faces are limited and all windows are high-efficiency Serious Windows, series 700 or 900, providing at least an R-5.6 and SHGC of .21. Energy modeling shading simulation software was used to determine the most efficient percentage of window area to wall for the North, South, East and West walls. This Off-The-Grid house has exceeded expectations with its performance and intuitive design. The homeowners are thrilled that their dreams of an up-to-date, sustainable home filled with cutting edge technology have come true without having to sacrifice their craftsman style aesthetic. This house proves that modern technology can be used in any style home.